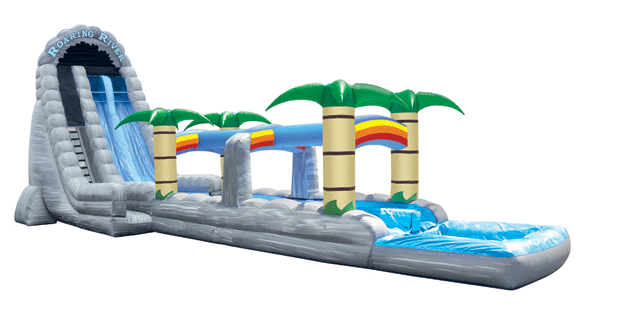 Our 30' Roaring River Rock Arch 2 lane Slip 'N Slide Combo features a radical sliding angle that's sure to get the adrenaline pumping as riders scream down our 30' Water Slide. At the bottom, riders continue down 31' of additional sliding fun before exiting this mind blowing ride. Perfect kids and adults ages 6 and up. Our 30' Roaring River Water Slide is made with lead free vinyl and is fire retardant, it has a safety step so that the players don't get hurt scrambling to get on to the slide and anti-jump netting at the top of the slide to prevent falls and unsafe behaviors.